With a 60-year heritage, Gallivan, White, & Boyd, P.A. is one of the Southeast’s leading litigation and business law firms. GWB's products liability team has extensive experience in defending a wide variety of products liability claims, including mass tort and catastrophic loss claims, as well as conducting accident investigations and providing strategic advocacy services to our clients. Gallivan, White & Boyd, P.A. has offices in Greenville, S.C., Charleston, S.C., Columbia, S.C., and Charlotte, N.C.
As you know, we here at Abnormal Use often, perhaps incessantly, have written about the Stella Liebeck McDonald’s hot coffee case. Today, we revisit that case not to discuss its merits or legacy, but to remark upon one of history’s interesting twists. No matter your position on the issues presented by the Liebeck case, this is an intriguing historical tidbit. At its essence, the Liebeck case was a products liability case in which the Plaintiff alleged that the hot coffee at issue was, by its very nature, “excessively hot” and “manufactured defectively due to excessive heat.” In her suit, the Plaintiff alleged that she sustained “severe and painful burns” which resulted in “skin grafting, debridement, and general recovery from painful scaring, as well as pain and discomfort associated with drawn and tight skin in the scarred areas, which pain and discomfort persists at the present and will persist into the future.” Obviously, as a result of alleging such claims and injuries, the Plaintiff needed some expert medical testimony to establish her claims. The Plaintiff designated Dr. Charles Baxter, a medical doctor as her “burn specialist.” At the trial, Dr. Baxter opined that coffee served at 180 degrees was simply too hot and the ideal range for a coffee’s temperature to be served was between 150 and 160 degrees. Dr. Baxter has an interesting resume. Charles L. Baxter, 75, one of the doctors who tried to save President John F. Kennedy after he was shot in Dallas on November 22, 1963 died March 10 at the University of Texas Southwestern Medical Center in Dallas where he had been a professor emeritus of surgery since 1993. That same day, Dr. Baxter operated on Texas Governor John Connolly. Dr. Baxter developed a formula for burn patients, referred to as the Baxter Burn Formula or the Parkland Burn Formula. He discovered that patients with large, severe burns need tremendous amounts of fluid the first day of treatment, especially during the first eight hours. Dr. Baxter also founded a tissue bank at Parkland Hospital to provide skin grafts for burn patients. According to the Texas Medical Board, Dr. Baxter received his medical license on August 14, 1954. This means that at the time of the Liebeck trial, which took place on August 8-12 and 15-17, 1994, he had been a licensed medical doctor for 40 years to the day. Oh, and here is a link to Dr. Baxter’s testimony before the Warren Commission. As you of course already know, we here at Abnormal Use have devoted much time to the discussion of hot coffee lawsuits. As we have often suggested, supporters of cases like the infamous Stella Liebeck v. McDonald’s case focus too much on the damages and not enough on the liability issues, such as whether coffee is an “unreasonably dangerous” product. After all, in a tort action, a plaintiff doesn’t get to damages without first proving liability. Now, a new report has us questioning our position. According to a news report from CBS-Los Angeles, a California woman is facing two dozen counts of felony insurance and workers compensation fraud for allegedly submitting false damages materials pertaining to a hot coffee claim. The criminal complaint filed in the San Bernardino County Superior Court states that the woman claimed that hot coffee was spilled on her hand when she was handed a cup with an unsecured lid at a McDonalds drive-thru. Thereafter, she submitted photos of second-degree burns she allegedly lifted from the Internet. Couple that with medical records she allegedly doctored, and you have serious fraud, if true. And, to think, after all this time, after writing about all of these cases, we just assumed the burns were legit. In all seriousness, we know that hot coffee can cause burns, and this incident is an outlier. That said, we have to wonder how much influence the Liebeck verdict and its legacy had on this woman’s plan. Or, maybe she consulted with Jackie Chiles. Either way, we have to give her some credit. At least she knew to attribute some independent act of negligence to McDonalds (i.e. spilling the coffee) rather than complain about the temperature of the coffee itself. According to a report from The Buffalo News, G.B. Restaurants, the parent company of Denny’s, recently paid $500,000 to settle yet another hot coffee-related lawsuit. While this settlement is not so far removed from the 20th anniversary of the infamous Stella Liebeck-McDonald’s hot coffee case, the underlying theory of liability couldn’t be more different. In this case, Jose Adams and Sally Irizarry of Puerto Rico sued the restaurant chain after their 14-month old daughter was burned by hot coffee in a Buffalo, New York Denny’s. The daughter sustained those burns after she grabbed a cup of coffee off of the table and spilled it on herself. The crux of the lawsuit is whether the waitress was negligent in placing the coffee within arm’s reach of the child – not that the coffee was unreasonably dangerous as alleged in the Liebeck suit. With every new hot coffee case that hits the news, the media can’t help itself but to make comparisons to the now 20-year old Liebeck case. (We tend to do a bit of the same ourselves, but that’s why you love this blog, right?) In fact, The Buffalo News began and ended its report with references to the Liebeck case even though the only link those cases share is the presence of hot coffee. Without the Liebeck case coming before it, we doubt this case would have garnered its own headline (or be the source of blog fodder). Liebeck comparisons aside, this case has its own liability issues. We do not know much about the facts of the case, but we have to wonder how long the cup sat on the table prior to the child pulling it off. As former patrons of Denny’s, we know that table space can be limited depending on the size of the food orders. Also, as parents, we certainly can empathize with the perils of having young children in restaurants. However, we are also cognizant of a child’s reaching hands and plan accordingly. Should a waitress be responsible for placing the coffee too near the child? Maybe, but these other factors should also be considered when analyzing how the coffee got onto the child in the first place. We’ll keep you posted on this case if circumstances warrant. As you know, we here at Abnormal Use have written a good bit about the infamous Stella Liebeck McDonald’s hot coffee case. Well, if you’re in Charlotte, North Carolina in November, you can see Abnormal Use writers Jim Dedman and Nick Farr speak in person about the case at an upcoming CLE sponsored by the Mecklenburg County Bar Association. Wed., Nov. 19, from 3:30 p.m. – 5 p.m.
James M. Dedman, IV, Partner, Gallivan, White & Boyd, P.A. 3:30 p.m. – 4 p.m.
Recap of the basic facts of the case and the effort to dispel some of the broader myths that have arisen over the years regarding the “hot coffee” litigation. 4 p.m. – 4:30 p.m.
Nicholas A. Farr, Gallivan, White & Boyd, P.A. 4:30 p.m. – 5 p.m.
To register, and earn CLE credit, click here. As we complete this week’s coverage of the twentieth anniversary of the Stella Liebeck McDonald’s hot coffee trial, we thought it might be fun to revisit some of our past hot coffee and food related posts. 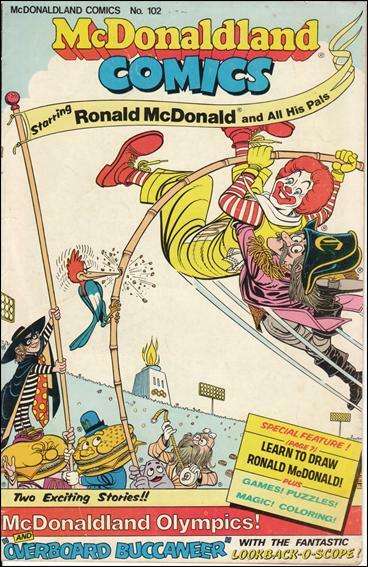 But first: Above, you’ll find the cover of McDonaldland Comics #102 which we felt we had to share in light of this week’s theme. We’re not entirely certain what Ronald McDonald is doing on the cover, but surely, he is being contributorily negligent. And with that, we return to the Liebeck case one last time this week to direct you to some links to our favorite blog posts on that and other hot food and beverage cases. “The McDonald’s Hot Coffee Case: Revisiting The Eyewitness Trial Testimony” (Jim Dedman, August 13, 2014). “20 Years of McDonald’s Hot Coffee Case Rhetoric” (Nick Farr, August 12, 2014). “20 Years Ago This Week: The Stella Liebeck McDonald’s Hot Coffee Trial” (Jim Dedman, August 11, 2014). “The Stella Liebeck McDonald’s Hot Coffee Case FAQ” (Jim Dedman, January 25, 2011). “Spill the Beans: The Truth Behind Susan Saladoff’s “Hot Coffee” Documentary” (Nick Farr, January 24, 2011). “Abnormal Use Cited in Today’s New York Times on ‘Hot Coffee’ Documentary” (Jim Dedman, June 26, 2011). “Film Review: Susan Saladoff’s “Hot Coffee” Documentary” (Nick Farr, June 27, 2011). “Statutory Construction: What is a “Documentary” Film?” (Jim Dedman, October 13, 2011). “Thoughts on “Hot Coffee” Director Susan Saladoff’s Appearance on “The Colbert Report”” (Nick Farr, October 26, 2011). “The McDonald’s Hot Coffee Case: Distinguishing Between Facts and Theory” (Nick Farr, March 19, 2013). “Photograph of the Day: The Canadian Hot Coffee Warning?” (Nick Farr, April 24, 2013). “The New York Times Reflects On Post-Liebeck Life” (Nick Farr, November 7, 2013). “Hot Queso Jurisprudence in Pennsylvania” (Jim Dedman, December 12, 2013). “Liebeck v. McDonalds Restaurants: The Original Coffee Product Liability Case” (Jim Dedman, April 24, 2014). Medical malpractice has killed more Americans in the past week than Ebola has killed worldwide since the first recorded outbreak in 1976. Two months ago, a Wal-Mart truck driver who had been awake for 25 hours, as permitted by company policy, plowed into a van full of comedians. But when it comes to tort law, those issues stand in the long shadow of a 49-cent cup of coffee served a week after Wayne’s World hit theaters. It shouldn’t be that way, but it is, and so there is use in continued legal anthropology of the Liebeck v. McDonald’s case. That said, I’m not going to make another argument for the damage that misunderstandings about the Stella Liebeck case have done to the civil justice system. Go watch “Hot Coffee” or read Priceonomics. Instead, I’m going to review the case as if it was just another personal injury case. With that in mind, let’s first discuss how the case likely looked to the plaintiff’s lawyers when they initially filed it. Trial lawyers sometimes classify the damages of cases as trivial, minor, severe, catastrophic, or death. “Trivial” cases involve fleeting emotional harm, like bugs in food and rude doctors. “Minor” cases involve soft tissue injuries and hairline fractures that heal. “Severe” cases involve major breaks of bones, lacerations, significant losses of blood, and some burns. Stella’s third-degree burns over 6 percent of her body would make her case at least “severe.” Keep that in mind as we go forward. Plaintiff’s lawyers routinely see cases in which a hot water device fails and burns someone. Just this year, I saw a case where the water heater at a motel malfunctioned, producing over 200° water and an instant burn when a child turned on their room sink, and I saw a case where a professional coffee machine kept re-boiling the hot water, producing a blast of scalding steam when an employee tried to change the brew basket. Stella’s burns are far worse than what you would expect from spilled coffee; they’re more like burns from frying oil. If I saw her file come into our firm, I wouldn’t assume I was going to challenge McDonald’s nationwide coffee-making process. Rather, I would assume that either the restaurant had a broken coffee maker or that an employee had messed up the setting. Is there an element of comparative fault to the case? Sure, but Stella – a sweet, credible grandmother – didn’t do anything wildly unreasonable. She didn’t put the coffee to an “abnormal use.” She put the cup between her legs, which was, and is, common. Negligent? Maybe, and her recovery could be reduced accordingly. Then there’s another factor that likely contributed to Stella’s decision to find a lawyer and the lawyer’s decision to take the case: McDonald’s acted like complete jerks. When one of your customers is severely injured by your product, and all they want is compensation for medical expenses and lost income, you should talk to them. Yet, McDonald’s treated her case as trivial, the way they would treat a bug-in-the-hamburger case, offering her $800. That’s the type of “from good hands to boxing gloves” treatment that is the epitome of social injustice: a corporation refusing to pay its dues because it knows the injured consumer lacks the will and the resources to fight. But Stella and her lawyer did fight. Now, let’s look at the case post-verdict, as we would any other personal injury trial. At core, the case boils down to – pardon the pun – one purely factual question and one mixed legal–factual question. The purely factual question is: how hot do you think the coffee was? This isn’t exactly brain surgery. Like jurors, we should take in what the experts at trial said, but the experts differed by 50°! Like jurors, we should use our common sense and common experience to guide us. My water heater at home is set to 130°, a balance between the 120° recommended by the by the CPSC to prevent burns and the 140° recommended by OSHA to eradicate Legionnaires’ disease. It’s a balance: I want to minimize the risk of disease, but I don’t want to literally scar my kids for life if they turn the faucet the wrong way. As the CPSC says, “Most adults will suffer third-degree burns if exposed to 150 degree water for two seconds. Burns will also occur with a six-second exposure to 140 degree water or with a thirty second exposure to 130 degree water.” Hence my compromise. When I brew my coffee, though, I set the kettle to 190°, brew the coffee for about 5 minutes, then add some milk or cream, so that the coffee is approximately 137° (I measured it) by the time I start drinking it. My “common sense” tells me that the 130° water in my faucet is not hot enough to give me anything like the burns Stella suffered, whereas the 190° water from my kettle is. So I did an experiment: I set my kettle 130°, poured it into a cup, and then stuck my finger in it with a timer. I lasted about 5 seconds before I felt compelled to remove my finger, and suffered no injury. Then I tried it again at 190° and I couldn’t even get the tip of my finger in, because my instinct made me to remove it. Common sense, right? Common experience, too. McDonald’s defense was stupid and insulting. Whenever someone lectures me about my chosen profession by way of “that spilled coffee case,” I tell them: “McDonald’s tried to convince a jury that 130° water causes burns just as bad as 180° water.” The interlocutor usually stares at me in disbelief then insists that can’t be true. It is true: McDonald’s tried to convince the jury that a small cup of 130° coffee can cause third-degree burns all across a person’s groin and thighs just the same as coffee at 140°, 150°, 160°, 170°, and 180° or higher. The coffee was obviously much closer to 180° than to 130° — it might have even been higher — and McDonald’s argument was transparently frivolous. Little wonder the jury found against McDonald’s on that. Once the jury resolved that purely factual question, they needed to resolve this mixed legal–factual question: at what temperature it is unreasonable to serve coffee at drive-through in a deformable cup with an unsecured lid? Whatever you think the answer should be, in the trial of Liebeck v. McDonald’s, it’s quite likely the answer was: any temperature substantially above 130°. Sound crazy? My own breakfast coffee made at just the right temperature where I can start drinking it might meet that, and surely that can’t be the standard — but thinking like that is just letting my own personal policy preferences intrude upon the actual evidence at trial. 130° is the number McDonald’s suggested to the jury. Plaintiff’s burn specialist testified that coffee should served around 160°, and that anything over 180° was not fit for consumption. McDonald’s, however, built their entire defense around 130°. They had a doctor testify that 130° is the temperature at which severe burns are inevitable, a unique threshold above which temperatures are irrelevant. Then they had another witness testify that no other coffee place served coffee below 130°. McDonald’s drew that 130° line in the sand. Was a jury supposed to ignore the obvious implications of that line? To only accept McDonald’s arguments if they helped McDonald’s? McDonald’s effectively admitted that it served every single customer coffee hot enough to cause third-degree burns over a substantial part of their body, and that it had no interest in doing otherwise — and thus effectively admitted the need for punitive damages, too. We’ll never know what might have happened if McDonald’s had offered Ms. Liebeck a more reasonable settlement before she filed her lawsuit, or if it had treated the incident with the dignity and importance it deserved. But I know this much: McDonald’s approach to the case made the result inevitable. BIOGRAPHY: Max Kennerly is a plaintiff’s attorney at The Beasley Firm in Philadelphia, Pennsylvania. He blogs at Litigation & Trial. One chilly morning in February of 1992, a routine purchase of a cup of coffee in Albuquerque, New Mexico forever transformed the tort reform debate. As a result of the spill of that cup of coffee, 79 year old Stella Liebeck would become the world’s most famous civil litigant. Twenty years ago this week, in August of 1994, Liebeck took her case to a Bernalillo County jury, which awarded her $200,000 in actual damages (reduced by 20 percent due to a comparative fault finding) and $2.7 million in punitive damages. The court later ordered that a new trial would be held due to the “excessive” amount of punitive damages unless the Plaintiff accepted a remittitur of the punitive damages award to $480,000. A few months later, the case settled for a confidential amount, forever establishing it as a fixture of litigation lore and urban legend. The two week trial would become the most discussed civil case of its time and fodder for late night comedians. Despite the passage of two decades, the underlying facts of the case continue to be debated and myths abound, in part, because there is no widely accessible official account of the case. Because the case settled a few months after its notorious verdict, no appellate court issued an opinion setting forth its key facts and legal issues. Even today, civil litigation is not often covered in detail in the media, and in 1994, the nascent Internet had yet to provide access to online dockets, pleadings, and the like. So it was that a 1994 Wall Street Journal article and the late night talk shows shaped the opinions of the case for years to come. In his opening statement, Liebeck’s attorney explained to the jury that Liebeck “received this eight ounce cup of coffee handed to her by her grandson, and placed it in between her knees to hold it because she had difficulty in removing the plastic lid.” Of course, the trial involved a host of expert opinions, warning issues, and damages testimony. But, at its essence, the case involved the actions of Liebeck. All these years later, the trial testimony of Liebeck and her 30 year old grandson, Chris Tiano, are helpful in dispelling the myths that have arisen over the years. First and foremost, despite what you may have read, Liebeck was not driving the vehicle. In fact, Tiano was driving the 1989 Ford Probe as they ordered breakfast that morning. Liebeck was in the front passenger seat. The two had just driven Liebeck’s brother from Santa Fe to Albuquerque to drop him off at the airport. After that errand, they visited the drive-through of the McDonald’s on Gibson Boulevard. At trial, Tiano estimated that they at the restaurant sometime before 8:30 a.m. that fateful Thursday morning. On August 9, 1994, Tiano, the first trial witness, recalled that they “ordered a couple of value meals,” with him ordering a Sausage McMuffin and orange juice and his grandmother choosing an Egg McMuffin and a coffee. Liebeck testified that Tiano requested the cream and sugar for her coffee. He drove to the window and the McDonald’s employee “handed the drinks out first” and he “handed it over” to Liebeck. The next day of trial, August 10, Liebeck testified that she did not believe that Tiano requested a cardboard tray for the beverages. The vehicle was not in motion when Liebeck spilled coffee on herself. After taking the drinks and bag of food, Tiano drove from the drive-through to a parking space in the McDonald’s lot. Liebeck testified that Tiano parked “so [she] could put cream in [her] coffee.” On cross examination, Liebeck agreed that the cup’s lid was on “pretty snug” and that the cup did not leak at the time it was handed to her. She did not notice the pull away tab on the lid (which existed, the defense contended, to permit the addition of cream and sugar to the coffee). Tiano testified that Liebeck “started to fix her coffee” as he was “trying to get [his] meal organized” because he “had to run some errands that morning.” Specifically, Tiano planned to visit the Albuquerque Country Club so that he, an assistant golf professional, could pick up a check for his golf pro father. Liebeck positioned the cup of coffee between her legs in an attempt to open the lid to add cream and sugar. Liebeck testified that she initially looked for somewhere else to put the cup of coffee before deciding to hold it between her knees. On that point, she testified that she “took the cup and [she] tried to get the top off” but she “couldn’t hold it, so [she] put it between [her] knees and tried to get the top off that way.” In so doing, she “accidentally” spilled the coffee into her lap when the lid “slid” and “tipped off.” When asked on cross if she still felt it was wise to hold a cup of hot coffee between one’s knees, she replied that doing so was “just a normal thing to do” as she “wouldn’t expect [the lid] to slide over.” Immediately after the spill, Liebeck felt “excruciating, searing pain.” Tiano testified that he “looked over” after Liebeck “started screaming” and saw “the cup was inward.” Liebeck testified: “I went into shock. I became all clammy, cold, and was fainting and throwing up or I thought I was throwing up.” The photographs of Liebeck’s injuries – made public in the recent HBO documentary “Hot Coffee” – illustrate the severity of the injuries sustained by Liebeck as a result of the spill. After the spill, Liebeck and Tiano did not return to the McDonald’s for assistance. Neither Tiano nor Liebeck testified that they returned to the McDonald’s to seek help after the spill. Tiano exited his side of the vehicle and ran to the other side to investigate the reason for his grandmother’s pain and discomfort. He testified that he shouted to his grandmother that “it’s just coffee. It’s just a hot water burn, nothing serious.” He further testified that he “let her walk around in the chilly air” and “she cooled off and got back into the car.” He “thought everything was fine” and the two then “drove down the road” to address his aforementioned errands. At least during their trial testimony, neither of the two witnesses mentioned seeking help from the employees of the McDonald’s franchise. After leaving the McDonald’s parking lot, Tiano and Liebeck did not immediately seek medical care. Tiano proceeded to the Albuquerque Country Club as planned, and as he testified at trial, Liebeck began to feel nauseous, but he was “still not thinking it’s very serious.” Tiano stopped the vehicle on the side of the road because Liebeck felt she might vomit. As they were stopped, an observant resident emerged from her home to see if they wanted her to call 911. They declined and proceeded again to the country club. Once there, Tiano testified that he left Liebeck in the car as he went to retrieve the check. It was only when he returned to the vehicle that Liebeck requested that they find a local fire station to seek first aid. Ultimately, they drove to Northside Presbyterian Hospital, where she was seen immediately for medical treatment. Since the birth of Abnormal Use way back in 2010, we have written much about Stella Liebeck and the infamous McDonald’s hot coffee case. There was no conscious plan to focus on this matter, but sometimes, things simply fall into place. When we published our initial post on Susan Saladoff’s “Hot Coffee“ documentary back on January 24, 2011, and our accompanying Stella Liebeck FAQ file the following day, we did not predict we would revisit the case as often as we ultimately have. However, within just a few months, those posts generated a friendly retort from a popular social justice blog, a shoutout on National Public Radio, and a mention in, of all things, The New York Times. Abnormal Use would never be the same, and as the years have passed, we have attempted to learn as much as we can about the underling facts and procedural history of the case. This week, in recognition of the twentieth anniversary of the hot coffee trial, we here at Abnormal Use are offering you some additional thoughts on the case and its legacy. What is it about a 20 year old New Mexico jury trial that continues to create so much furor today? Sure, the case has crept into our vernacular through its references in pop culture, but why? It is ludicrous when one thinks about the hundreds, if not thousands, of personal injury cases that are filed each and every day, many of which involve allegedly defective products, yet the one that garners the most attention is the one about a single cup of coffee. Certainly, the initial media coverage of a litigant receiving millions of dollars due to a hot coffee spill created much public buzz. The subsequent propaganda – from supporters and opponents of tort reform alike – infused the case with additional life as each side attempted to spin the case facts in its own favor. As Internet blogs continue to revisit the litigation, nearly every one has an opinion on the case. One need only visit at the comments section of Abnormal Use as evidence of the passion surrounding the case. In fact, our hot coffee posts continue to garner comments – sometimes many years after the dates of those posts’ initial publication. While the readers of Abnormal Use may not be a perfect representative sample of the general populace, those comments are certainly evidence that the hot coffee case is far from ordinary. The more surprising component of the case is its polarity. It seems that one cannot now engage in an objective discussion of the case without first declaring one’s self, “Team Liebeck” or “Team McDonald’s” (or, worse, “Team Tort Reform” or “Team Social Justice”). The caustic nature of the debate is worsened by a general lack of public knowledge of the true facts of the case. Additionally, many advocates stress only those “facts” they chooses to hear while ignoring others that don’t fit nicely into their theory of the case (suggesting that all of us will continue to relitigate the case well into the future). The opinions on the case tend to fall into one of two categories. There are those who stress the liability issues and those who focus on the damages. The talking points for both camps have been rehashed and recycled many, many times (often without reference to the specific motions or testimony in the case). Yet, each camp has its flaws. Those who argue Liebeck’s contributory negligence run the risk of seeming unsympathetic to her rather severe injuries. Conversely, those who focus on those horrific injuries often overlook the fact that damages are only one element of a negligence claim – an element that is not addressed unless it is first shown that the defendant’s conduct was, in fact, negligent. Neither side is necessarily disingenuous; however, they don’t always see the whole picture of the case when focusing on singular components. In looking back over the past 20 years, what is the real effect of the Liebeck verdict? Other than providing talking points for lawyers and staking a claim in pop culture, not much. People still drink coffee. They still like their coffee to be served piping hot. Restaurants still serve coffee at temperatures within the range served to Liebeck by McDonald’s in New Mexico that fateful day in February of 1992. At the end of the day, Liebeck v. McDonald’s has provided us with a discourse to advocate for certain platforms. This is not to say that the hot coffee case doesn’t remain important after 20 years. But in the end, these days, it’s mostly just rhetoric. 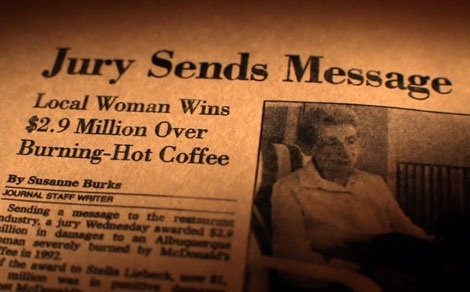 As we noted last Friday, August 2014 heralds the twentieth anniversary of one of the most famous civil cases in American history: the Stella Liebeck McDonald’s hot coffee case. Tried on August 8-12 and 15-17, 1994 in New Mexico state court, the case produced a verdict that has continued to reverberate throughout our culture. (Reminder: Liebeck was awarded $200,000 in compensatory damages, a number which was reduced to $160,000 as a result of a patrial contributory negligence finding by the jury. She was also awarded $2.7 million in punitive damages, a figure which was later reduced to $480,000 by the court.). As we have noted in the past, the case settled prior to the issuance of a formal appellate court opinion, and thus, there is no helpful formal account of the matter’s factual and procedural history. This has led to some confusion surrounding the facts, which we’ve attempted to remedy by publishing our Stella Liebeck McDonald’s Hot Coffee Case FAQ. This week, in observance of the trial’s 20th anniversary, we will explore the case in a bit more detail than usual and offer some critical thoughts that go beyond the traditional rhetoric. In his piece, Mayyasi relies a good bit on Saladoff, a former plaintiff’s attorney about whom we have previously written here. In so doing, Mayyashi shares Saladoff’s belief that “frivolous lawsuits” are a “myth.” (Were that truly the case, we’d have little to discuss here at Abnormal Use.). To his credit, Mayyasi identifies Saladoff as a “former trial lawyer” who has “represented clients in liability lawsuits” and suggests later in the article that “as a trial lawyer . . . [she] is not an objective outsider but someone building a case for her side.” (Many media outlets, in reviewing or reporting on “Hot Coffee,” neglected to mention Saladoff’s history.). Further, despite Doctorow’s tough introduction to the piece, Mayyasi concedes several points, including the fact that “[c]offee is often served commercially at temperatures approaching or equal to that served to Stella Liebeck; finding Liebeck 80% or 100% responsible may be reasonable.” He also indicates that the McDonald’s representatives’ purported lack of concern about the alleged 700 complaints of hot beverage related incidents “may have seen reasonable given the scale of McDonald’s operation.” Those are some significant statements in a piece dedicated to Liebeck case and the purported erosion of the right to a jury trial. After Ms. Liebeck bought her coffee and breakfast, her grandson, who was driving, pulled over so she could add cream and sugar to her coffee. Since his Ford Probe had no cup holders, she placed the cup between her legs. When she fumbled with the lid and spilled the coffee on her sweatpants, she began to scream. She went into shock and her grandson rushed her to the emergency room, where she would undergo surgery and receive skin grafts. She had third degree burns on 6% of her body; the pictures of her injuries are shocking. It is the gruesome photographs of Ms. Liebeck’s injuries – recently receiving prominence in Saladoff’s documentary – which have convinced many that Ms. Liebeck’s case must have had some merit. Despite the severity of her injuries, Liebeck elected to place the cup of coffee – with its warning “contents hot” emblazoned thereupon – precariously between her legs in attempt to open it and place her cream and sugar therein. How is it a distortion to recite those facts and argue that Liebeck’s contributory negligence should have barred her recovery outright? Can one not argue that the jury got it wrong, or that the defense should have presented a better case with the facts as known? (Interestingly, it is not entirely correct to say that “[Liebeck’s] grandson rushed her to the emergency room.” Rather, her grandson, Chris Tiano, testified at the trial that after the spill he traveled to the Albuquerque Country Club to pick up a paycheck before taking his grandmother to the hospital.). This week, we’ll explore these issues fully and even offer some interesting trivia about the case and even some of the witnesses. We hope you’ll offer your own thoughts on the case, as well. For better or worse, the infamous Stella Liebeck McDonald’s hot coffee case filtered through our legal system and staked its claim in the mainstream media. Despite the fanfare surrounding that case, few know all the in’s and out’s of the case from either the plaintiff’s or the defendant’s perspective. Perhaps playing on the ignorance of the general populace, supporters of both tort reform and social justice movements have used the case as propaganda to support their causes. We suppose there is no harm done in using the case as a means of persuading the public. But what would happen if the case was used to sway a jury? Looking deep into the legal vault, the Utah Supreme Court gives us its answer to the question. Ladies and gentlemen, they want a lot of money for this. A lot of money. What’s been written on the board is called a per diem analysis…. How many days has it been since the accident? How many days for the rest of his life. And how much per day is that worth? That’s what’s been done here. That’s how we get verdicts like in the McDonald’s case with a cup of coffee. Whoa! Did that come out of nowhere? Plaintiff’s counsel sure thought so, immediately objecting to the reference as prejudicial and not in evidence. The objection was overruled, and the jury returned a verdict of $62,500, about one-seventh of that sought by the plaintiff. Not satisfied with the result and the reference to the infamous hot coffee case, the plaintiff appealed. Given the uniquely iconic nature of this case, the passion it has produced in the media, and the general misunderstanding of the totality of its facts and reasoning among the public, we find it hard to imagine a scenario where it would be proper for a party’s counsel to refer to it before a jury. Generally, as here, such a reference would seem to have the sole purpose of recalling the public outrage over isolated elements of the case—thus improperly appealing to a jury’s passions. It is not the jury’s job to make legal determinations, so no legal arguments from the case are relevant. The facts in the McDonald’s coffee case were not in evidence before this jury and were also utterly irrelevant. Indeed, the one attempt counsel made to make her reference seem relevant was a misrepresentation because the high punitive damages award in the McDonald’s coffee case had nothing to do with a per diem analysis. It is certainly unfair to require the other party to clarify all the misconceptions about this irrelevant case in the limited time allotted for closing argument. The great latitude provided in closing arguments regards reasonable inferences about evidence properly before the jury and does not extend to misrepresentations or efforts to appeal to a jury’s passions. Thus the reference to the McDonald’s coffee case in closing argument was improper. While we may disagree with some of the Court’s talking points, we have to agree that the reference to the McDonald’s case was improper in this context. The jury should be deciding the case based on the facts at hand and not based on whatever misconceptions they may have about another case tried in another jurisdiction years before. Interestingly, it appears that defense counsel may have been equally ignorant of the facts of the McDonald’s case as those sitting in the jury box. As the Court correctly noted, the high punitive damages awarded in the McDonald’s case were based on two days of coffee sales and not the per diem analysis used to calculate pain and suffering to which he was arguing. There is nothing wrong with continuing to discuss the McDonald’s case. We do it a lot here at Abnormal Use. However, we should keep it in its proper context and out of the courtroom. And, for good measure, let’s try to know the facts before bringing the case up in public.